The traditional territory of the Algonkin of Ontario covers over 9-million acres (14,000 square miles) within the watersheds of the Ottawa and Mattawa Rivers. This area includes the National Capital Region and most of Algonquin Provincial Park. Approximately 7,000 people of Algonkin descent live in the traditonal territory today. With the rebirth of their culture, families across the territory are uncovering their Algonkin and Nipissing ancestral roots. Many are making their voices known, no longer ashamed to admit their heritage for fear of discriminatory actions, as it was for their ancestors. The culture´s ancient ways are being unearthed and practiced. Some say the ancestors are urging them on -- arranging things. Today many First Nation tribes, including the Algonkin, are engaged in land claims. Whatever the result, the real test could be in how they, the government of Canada and the public, observe history and whether they´ll honour the lives and wisdom of the original people of this land -- and for that matter the land itself. Noreen Kruzich is a freelance writer and teacher, and a former television and radio investigative reporter for CBS, ABC and NPR affiliates. She established and headed up the Society of Children´s Book Writers and Illustrators in Canada and has taught with the Institute of Children´s Literature/Long Ridge Writers Group. With an ancestry dating back to the Governor of the Plymouth Colony and Mayflower arrival, and hidden links and bonds to First Nations, her own ancestral background reflects both the alliances and the hostility that existed between the two peoples. She is learning the Algonquin language, practises Native spirituality in her daily life, enjoys First Nation celebrations, events, workshops, and teachings across Ontario, and is a member of Omàmiwinini Pimàdjwowin Cultural Center at Pikwàkanagàn, Golden Lake, Ontario. The Ancestors Are Arranging Things was conceived and written on Algonkin traditional homeland. 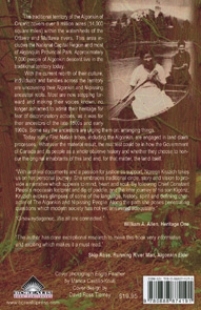 Proceeds from Noreen´s book will support the Algonkin culture. The ancestors are arranging things / Noreen Kruzich.